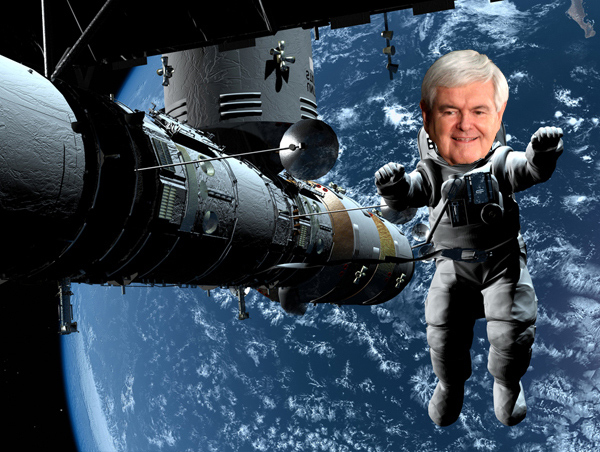 Courtesy of Shutterstock; Gage Skidmore/Wikimedia CommonsNewt Gingrich launched a Twitter frenzy on Wednesday when he delivered a major policy address on space at a Holiday Inn in Cocoa, Florida. Gingrich promised to complete a manned lunar colony on the moon by the end of his second term—January 2021—and set side aside 10 percent of NASA’s budget for prizes that would encourage entrepreneurs and inventors to experiment on their own. It’s a side of Gingrich we’ve seen flashes of on the campaign trail, but now he’s boldly going where he’s never gone before—or at least not in a long, long time. Send a team of astronauts to go to Halley’s Comet. “Projects like visiting Halley’s Comet could be easily undertaken by a program whose strength and sophistication would be unchallenged.” Basically, Gingrich anticipated the plot of Deep Impact. Cut food stamp budget to buy space shuttles. “Food stamps crowded out space shuttles; energy assistance crowded out a solar power satellite project that would have provided energy for all; more bureaucracy in Health and Human Services shoved aside a permanently-manned space station; the vision of a malaise-dominated decaying Western culture smothered the dream of a permanently-manned station.” Besides, who really needs food stamps when the moon is made of cheese? Cut farm subsidies; send farmers to space. Ok, this one wasn’t in his book but it’s too good to omit. In 1986, he told the World Science Fiction Convention: “If we’d spent as much on space as we’ve spent on farm programs, we could have taken all the extra farmers and put them on space stations working for a living in orbiting factories.” Somehow that subject didn’t come up in Iowa. Pay your taxes; win a trip to space. “The shuttle is already comfortable enough to carry anyone free of severe health problems into space, and the next generation shuttle will be even more like an airliner. We should begin with a candidate-selection lottery based on individual income tax forms and offer to send each year’s winner on a shuttle flight.” Not to be confused with the equally appealing option of sending our candidates into space. Mine the moon. “The moon is an enormous natural resource, possessed of more than enough minerals and materials to provide everything a self-replicating system needs. Structural glass and ceramics can be made by crushing rocks and molding them by hand; oxygen and water can be manufactured from the Moon’s soil to form life-support systems for humans.” And unobtanium. Don’t forget unobtanium. Self-replicating robots in space. “At the present there is a fight between the planetary scientists who debunk a manned station and the manned-space advocates who debunk robots. Both sides miss the point. We want both people and machines in space, in large numbers, as rapidly as possible.” The theory of the Earth’s demise in which self-replicating robots self-replicate ad infitum and consume all matter on earth is called “Grey Goo.” You’ll want to know that.